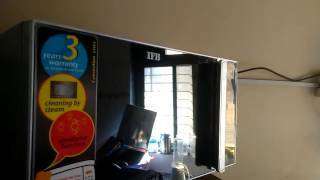 At flipkart.com you can purchase IFB 23 L Convection Microwave Oven(23SC3, Silver) for only Rs. 9,490, which is 25% less than the cost in Snapdeal (Rs. 12,695). The lowest price of IFB 23Ltr 23 Sc3 Convection Microwave Oven was obtained on April 24, 2019 6:04 am. 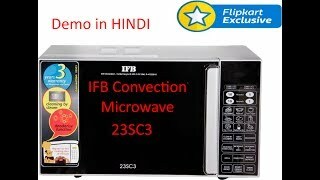 Superb IFB microwave with lowest price on amazon. A good looking product. But i felt its slightly underpowered in terms of cooking. It takes a little more time than expected. Dont expect to cook Dal or Rice in it. 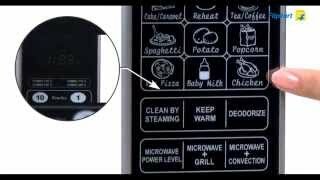 You need special vessels for that type of cooking and may be a more powerful microwave oven. But its ok for a small family to reheat and boil milk and make cakes and other stuff. Worst service from IFB. Even after 2 days requesting for a setup and demo, no updates from company side. demo not good; manual pathetic so don’t know how to use auto modes now.if we use without knowledge can damage oven and utensils. also if use plastic-ware in convection mode, dangerous.but auto mode no clarity on which is convection mode so can’t use them. not worth product. I am facing a problem within a six month. I have called to service center but not received proper response. Product review:Been 3days since delivery, I’m liking the product. It has some better features than LG and Samsung and equivalent to those brands in design and build. But has more power wattage requirement than LG and Samsung, will get to know if thats actually a disadvantage in my next month electricity bill (I may add up to this review after observation).Delivery review:Item was shipped from Bhilwara, Maharashtra to Bengaluru, Karnataka. The amazon packing box had got a bad blow during when I received it. Resulting in a bit big hole on both amazon packing box and inside IFB packing box. The product inside the box also has got that blow from the impact. There was a minor scratch. Job NOT done well !! It’s an impressive product. I really loved the recipe book came along with product. Tried few of them, really they were delicious. Basically I bought it for my mother. She is really happy using this product and said “it made her life a lot easier”. I recommend this product go ahead and buy it. It proves it’s worth. Defective item caused us a lot of trouble. Amazon was not ready to accept liability for the faulty transportation, thus costing us a dime. Absolutely disappointed. We ended up losing the money. I have received this product on 7th july. I am calling ifb service centre since 3 days for demo installation of this product but no one is responding. Always they are saying mam please wait today definitely our technician will solve your problems. Worst service from IFB.